Who may enter? The contest is open to children ages eight (8) to eighteen (18) who are members of child-led organizations assisted by a CRC Asia NGO partner. What is the theme? The photo entry should showcase how children are enjoying or not enjoying their rights. Each photograph must accompany a filled out entry form (see link below). What are the prizes? Eight winners will be selected and each winner will receive a prize in kind worth USD500 for his/her child-led organization. Upon notification, the winners will have to submit a request, with the approval of at least one officer of the child-led organization he/she represents AND their partner NGO, detailing a communication item that the child-led organization would want to receive. This could be a laptop, tablet, camera, printer, or other office equipment or supplies. The cash prizes will be coursed through the child-led organization’s partner NGO which will purchase the item/items and turn it/these over to the child-led organization. 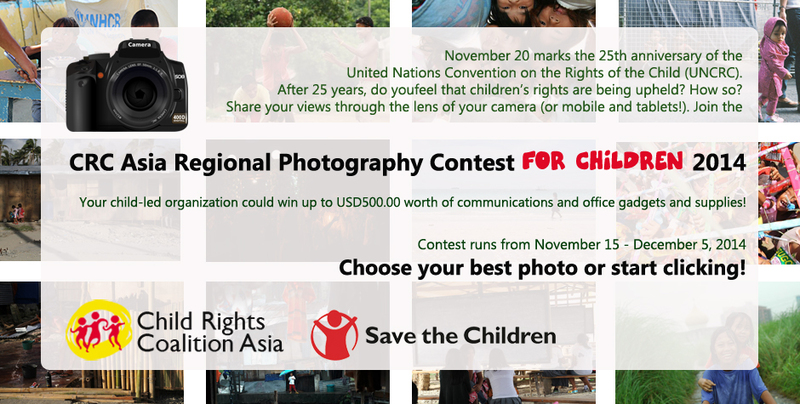 Term: The CRC Asia Regional Photography Contest for Kids begins on November 15, 2014 and ends December 5, 2014.
Who May Enter: The contest is open to children ages eight (8) to eighteen (18) on November 15, 2014 who are members of child-led organizations assisted by a CRC Asia NGO partner. Categories: Photos should showcase how children are enjoying or not enjoying their rights under the UNCRC. Each photograph must accompany a caption explaining it. The caption must answer the following in no particular order: 1) Who is in the photograph 2) What is the person/persons in the photograph doing 3) Where was this taken? 4) When was this taken? 5) What children’s right is being met or not met? Number of Entries: There should only be one submission per child-led organization.Therefore, prior to submission, the child-led organization must coordinate with interested contestants and decide on which photo to enter. Submission: Entries may be submitted in digital format online. Digital photos should be in JPEG format and must be at least 1,600 pixels on the longest side.Digital entries don’t have to be taken with a digital camera; scans of negatives or photographic prints will be accepted. Heavily Photoshopped of post-processed photos will not be eligible for a prize. Only minor cropping, brightness adjustments, and color correction are allowed. Submitted photos must have been taken in the year 2014. Make sure that submitted photos are your own. CRC Asia does not tolerate plagiarism. By entering the contest, the contestant represents, acknowledges and warrants that the submitted photograph is an original work created solely by him/her and that no other party has any right, title, claim, or interest in the photograph. Online entries must be emailed to [email protected] by December 5, at 11:59 PMPhilippine time (GMT+8).File should be labeled with the following file name: Contestant Surname_Country. A filled-out Entry Form (See link/attachment). Entry form must be complete for the entry to be valid. A filled-out Photographer Release and Waiver Form (See link/attachment). Prizes: Each winner will receive a prize in kind worth USD500. Prizes will be for the sole benefit of the child-led organization. Upon notification, the winners will have to submit a request, with the approval of at least one officer of the child-led organization he/she represents AND their partner NGO, detailing a communication item that the child-led organization would want to receive. This could be a laptop, tablet, camera, printer, or other office equipment or supplies. The cash prizes will be coursed through the child-led organization’s partner NGO which will purchase the item/items and turn it/these over to the child-led organization. Winner Selection: Winners will be determined by a professional photographer and two representatives from CRC Asia. Criteria for judging will be technical soundness including composition, creativity, and impact (50%) and relevance to the theme (50%). Entrant License/Release: By entering the contest, the contestants grant a royalty-free irrevocable, perpetual, non-exclusive license to Child Rights Coalition Asia to reproduce, distribute, display, and create derivative works of the photographs (photographer will be credited) in connection with the contest and to promote and disseminate other CRC-related works and activities online or in print. These include but are not limited to photo exhibitions, book, magazine, or pamphlet publication, posters, and online articles and graphics. Please submit the Photographer Release and Waiver Form with your entry. Third Party Releases: If the photograph contains any materials or elements that are not owned by the entrant and/or which are subject to the rights of third parties, and/or if any persons appear in the Photograph, the entrant is responsible for obtaining all releases and consents necessary for the free exhibition and use of the photograph prior to submission. Please submit the Model Release and Waiver Form/s with your entry (see link/attachment). Since children would most likely be the subjects of the submitted photos, a signature of each subject/s parent/s or legal guardian/s will be needed in the attached waiver form/s. Untuk event terbaru, tips fotografi atau review kamera bisa di cek di blog titik fokus kamera. Terima Kasih, Tetap Professional Walau Dengan Rental.